Published on 02 January 2006 at 6:00 PM by C.C. Following Julien Viale, it’s Yohann Truchet’s turn to leave the club. The Lyon defender has been loaned until the end of the season to Ligue 2 outfit Stade de Reims. Yohann Truchet has been loaned until the end of the season to Ligue 2 side Stade de Reims. 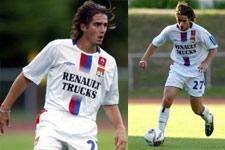 The 22-year-old Lyon defender played one match in the Champions League, against Sparta Prague in the 2004-05 season. By contrast, he has never played a Ligue 1 game, despite several apparitions in the first team squad last season. Captain of the reserve team, the native of the Villefranche/Sâone area had played 12 of the 15 matches disputed by the CFA side in Group B. In Champagne, Yohann Truchet will not be on his own as he will join former Lyon player Christophe Delmotte, who has been at the club for two seasons. Coached by Thierry Froger, Stade de Reims are currently 14th in Ligue 2, equal on points with Montpellier.